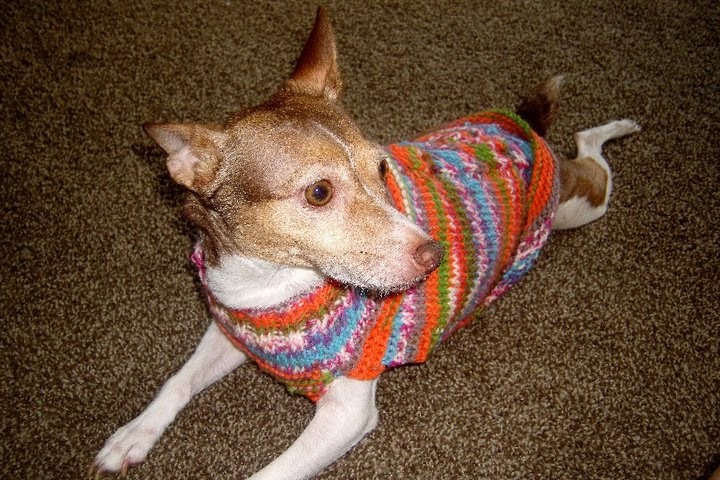 This blog post was originally published on my old blog, A Dog In A Sweater. It was an entry into a writing contest held by Interweave Crochet and won me first prize for comedic entry. I guess that means I am funny. Personally, I think I just think strangely and people just laugh because they don't know what else to do. I hope it helps to encourage crocheters to learn that more intimidating sister-craft of knitting. Where I first announce that I am knitting and admit my absolute ignorance to tell a knit from a purl. This was worth photographing. You have to read this in your best theatrical voice. And with a Southern Drawl, of course. I am sure if you asked the ladies in our stitching group they have blocked out the memory of me learning to knit. For their own sake I hope they have. I have a terrible tendency to 1. panic and 2. over-think everything new. If I catch myself in time I don't share my over-thinking with others because I know it is scary and it proves I am crazy. But sometimes it comes out and sorry, guys. (Still apologizing after all this time.) I scrolled back pages and pages of our stitching group to relive my panic at not being able to do a knit stitch. 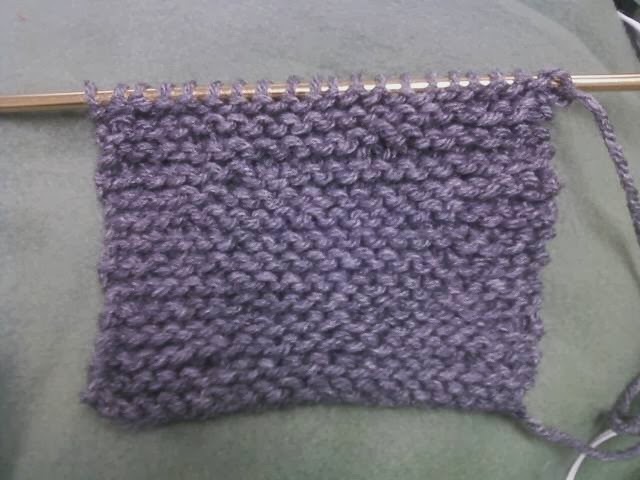 I could purl, but I could not knit. 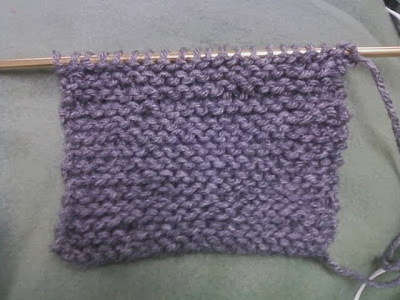 And even more sad, I thought what I was doing was knit and the purl was the one that was wrong. That was terrible. But that was not the beginning. The VERY beginning was two years prior. That was a very choppy 24 (ok probably just 2 before I gave up) hours. On a whim, I bought a pair of cheap knitting needles and set about trying to teach myself to knit. I remember this- it was at Michaels and I went to exchange some yarn only to find it was now on sale so I looked around for something that cost a couple of dollars and that was what I got- some Boye knitting needles. I had taught myself to crochet a year or so before with no problem, so I went home thinking I would learn to knit, too, and I was going to be awesome at it. Yessirree! My first attempt at the scarf that was meant to be blocks of garter in the center of a stockinette frame. WRONG. Someone asks me what the other side looks like. Several people agree it does not look different. 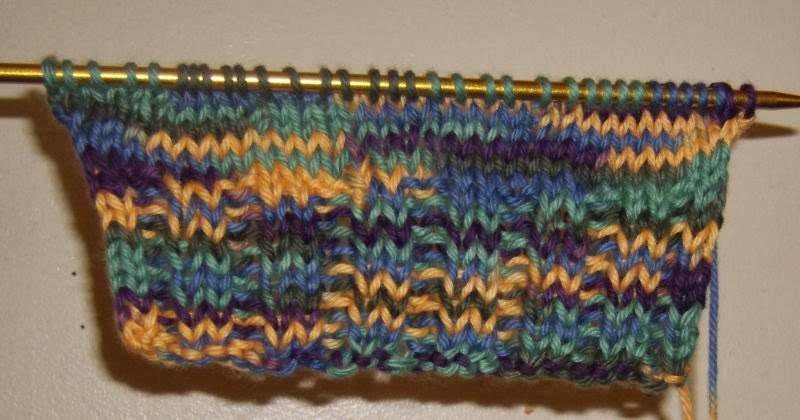 Finally someone comes in who is not just being polite and begins to hint that I am, in fact, only doing a garter stitch. And rather assbackwardsly. The other side looks exactly the same. I think I will just call this practice and start again. I can try binding off, at least. This is considered a good choice and proper learning attitude. They are probably all afraid of me at this point. Someone does suggest trying videos. I make excuses why I can't do this AGAIN. I have looked at more drawings and a video- they all show the purl different. I am just confused now. I was not doing it like any of them, though, so not sure what I was doing. My brain is totally fried by now. I can't even work a computer. Also can't find, again, where I saved the pattern, so once i find that I will post a screenshot here so you can see what it SHOULD look like. That was a rough day. The more that went wrong the more that went wrong. Finally, a friend was able to walk me through it. 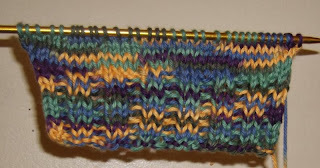 I did manage to follow the pattern for a bit. But HEY! 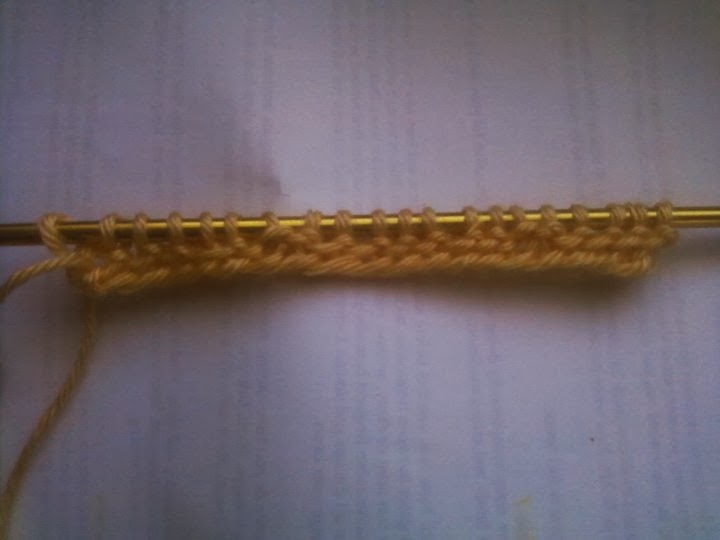 I am now a KNITTER! And what is the first thing we should do? I could sorta do some ribbing. I never even started the second one. This was enough. I never wore it. Fast forward a couple of months, between which time I have moved to a new town, settled into a new house finally with enough room to have a studio (aka room full of yarn and stuff). And true to my nature, I like to enter a marathon after my first couple of steps. 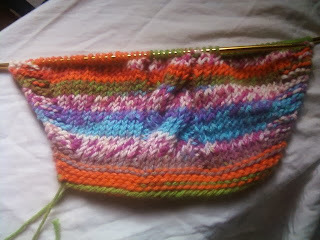 I decide that I am going to a. learn to do cables. 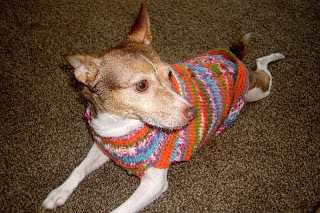 b. knit a dog sweater (since crochet dog sweaters are and always have been my specialty) and c. do this using gauge and without a pattern to follow because all the patterns are wrong. d. ALL AT THE SAME TIME! I still do not have proper size circular needles. I decide to knit 2 shapes and seam them and then pick up stitches to knit a ribbed collar. I have no idea what I am doing, but I am very enthusiastic about it! ah- and also was going to mention... my cute little acrylic circulars that Kate (former foster dog) destroyed now make excellent cable needles. I knew I held onto those for a reason! Ironically, I still do not own cable needles. I always do tiny cables and have never needed one. Maybe someday I will get more into that- but not yet. And also, not sure what I thought were so cool about acrylic needles back then. Pretty colors I reckon. I have since broken all of them. Also, they are not sharp. I immediately realize the problem with A. the tail curling and B. the neck is too stretchy. 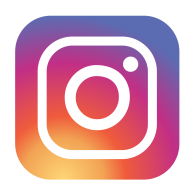 These are design problems, though. 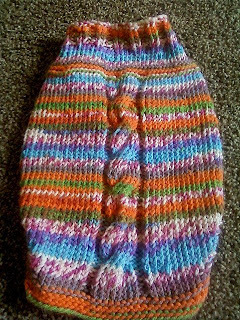 My knitting was executed properly! (if you don't look too closely!) 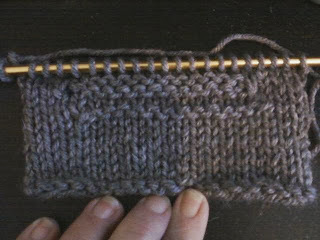 I had not learned about going down a needle size on the ribbing quite yet. I STILL get that one wrong sometimes if I go against my gut and do what the pattern says. 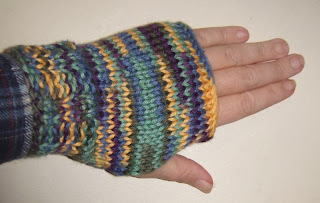 (WHY, pattern-writers- WHY?!?!?) Also, where I picked up stitches to knit the collar is SUCH a mess. BUT I got the gauge pretty right. It does fit her and she still wears it. Here she is today in the same sweater. This, my first knitting project SUCCESS! Yay! Good Luck to all! Thanks for making me take a break from knitting babylegs to write this! .